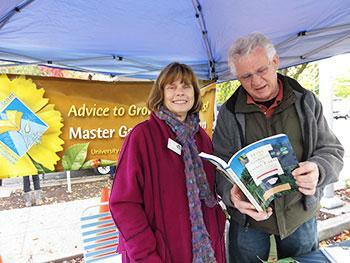 Look for the Master Gardener booth at the local seasonal farmers markets in Chico, Oroville, Paradise and Gridley. We are available to answer your gardening questions and provide guidance on sustainable gardening practices. Bring your gardening questions and stop by our booth; if possible, bring a sample or photograph related to your question. You can also find Butte County Master Gardener booths throughout the year at events such as the California Nut Festival, community garden tours, and our local fairs. Check our Events calendar for dates and times. Samples and photos related to your questions are strongly encouraged. Visit the Hotline page for additional information that will help us solve your problem. If you are interested in including our educational information booth at your event, please contact the Master Gardener Program Office at 530-538-7201.